iOS: Podcasting can be a tricky business to get into, but the newly-launched ZCast for iPhone makes it as easy as downloading an app, pressing record, and letting your stream fly. The service even integrates with Twitter, so you can let people know you're broadcasting so they can tune in live. Think of ZCast as an audio version of Google Hangouts. You specify your topic, invite your co-hosts (if there are any), press a button and you're live. 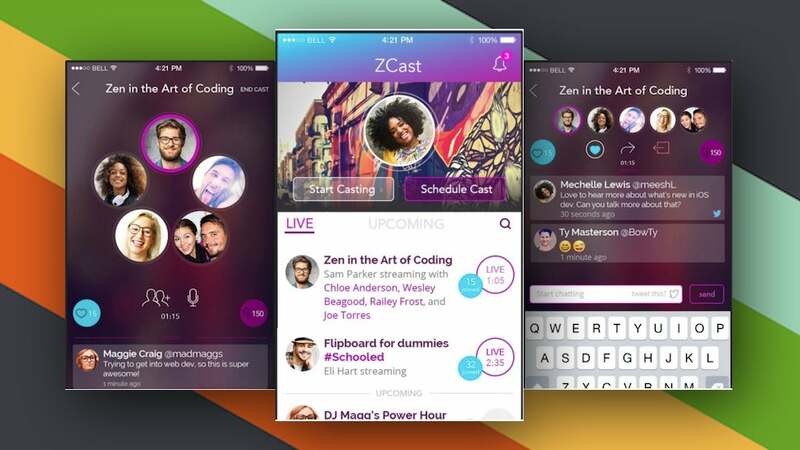 You sign into ZCast with your Twitter account, and Twitter is the preferred social stream for the service, so that's how you'll interact with listeners, take questions and post updates (or post the fact that you're streaming). The goal of the service is to break down some of the barriers to starting and running a podcast. You don't need a ton of audio equipment, or a mixer or a bunch of microphones. All you need is your smartphone and the app. Of course, you'll be able to record some great podcasts that way, and broadcast them live to listeners, but you won't have the professional audio and quality that a lot of podcasters listen closely for, so keep that in mind when you get started. Similarly, while the app is free and listening is free, you'll have to sign up for the service (again, using Twitter) to see previous podcasts, browse podcasts and streams to listen to and find people using the app you may already know. Right now the catalogue is a little thin, but if you were looking for something simple to help you get started with your brilliant podcast idea, it could be just the ticket.